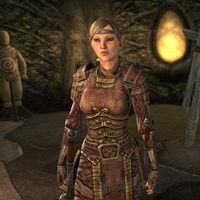 Borogilmith is a Bosmer member of the Fighters Guild and the Province General of Valenwood. She can be encountered with the other Council‎ members at the guildhall in Vulkwasten, Sentinel or Fort Amol during the quest Proving the Deed. Borogilmith can be found with the rest of the Fighter's Guild council, waiting for evidence linking to Jofnir's killer. "By the Green, I am uneasy. All this talk of death and magic. Give me something I can hit! "I didn't become province general of Valenwood through quiet meditation. I got this post through action!" "By the Green, share your news and be quick about it." "I bet things are going to get really interesting around here." This page was last modified on 30 July 2018, at 12:11.